This Raw Chia Strawberry Jam is jam without all the goodness boiled out. Just fruit and seeds with no added sugar. Makes a great jam or a healthy strawberry sauce. Just blend and leave for 20 minutes to thicken. Best to eat shortly after making, but will keep in the fridge for a few days. Any berry works well for this, such as blueberry, raspberry or blackberry. For less sweet berries such as blackberries or blackcurrants you many not need the lemon juice. Any sweetener works well but I usually use dates or maple syrup. Remove all the strawberry stalks. Place everything in a blender and blitz till all is combined. Leave to thicken for 20 minutes and enjoy. 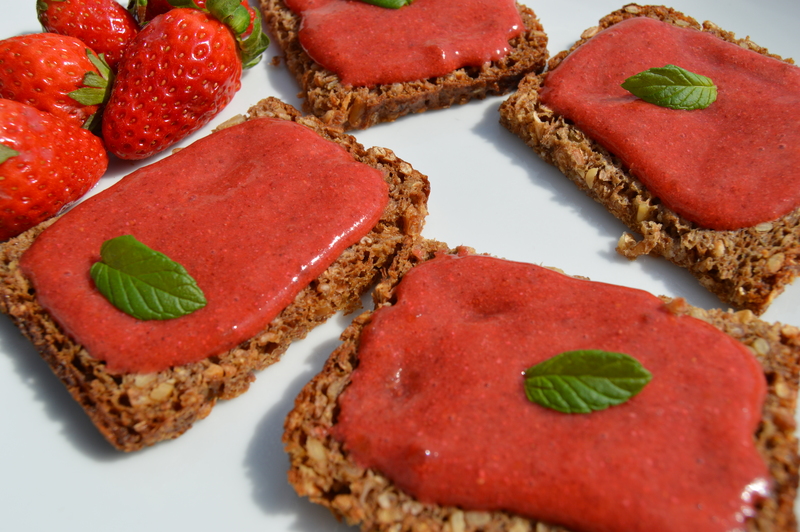 Raw chia strawberry jam spread on toasted rye bread and topped with a mint leaf. The chia seeds boost the nutritional content of this giving a protein boost and help to stay full for longer. They also work great to thicken the jam so it spreads well on toast. Only downside of this jam is that it does not preserve the fruit like normal jam. However you can place it in the freezer where it will last months, just leave to defrost in the fridge overnight. Once it’s defrosted you should eat within a day.